Family news is still dominated by Georgia’s grand entrance, but there are other things going on, too, i.e. Reid’s headed down this way, the garden is in, and a Big Red finally shows up in my boat. 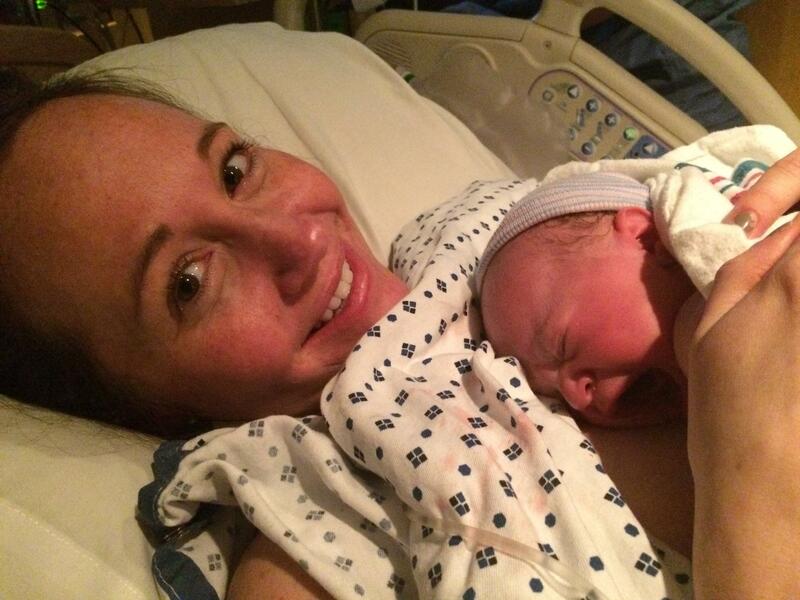 Ellen/Reid: So now there are two granddaughters. Welcome, Georgia. Wow. That little peanut is a little beauty. What a great photo that is, Ellen, of the two of you moments after she was born. Whew, and I’ll bet you’re glad that is over. Sort of funny to hear she’s a little night owl although that’s easy for me to say 1,200 miles away. At least your mom, then Nancy P. , will be there to help you the first few weeks. Ellen beams as Georgia announces her arrival. A couple of real cuties. To look at Georgia’s long fingers might be a tip off that she’ll be tall. Maybe 5’ 7” – 5’ 9”, something on that order. Emma seems a little reticent around her new sis but that’s only natural, one would think. She’s been the top fiddle for three years but she’ll be a good big sister in short order. To be a fly on the wall to hear those two bumpkins talk once Georgia is old enough. You and Tim will have your hands full. I’ve no real clue about what to get her. Some suggestions would be good and it would be fine to wait until I’m up there next month before any shopping is done. Did you keep a lot of Emma’s baby clothing? For some reason it rings a bell that you gave some of it away. That’s okay. So just toss some ideas out there. Reid, even though your weekend in Raleigh for the wedding should be packed, I’m looking forward to however much time you and Liz can spare. So just let me know what works for you. How’s an early Saturday morning breakfast sound? I could be up there around 8:30 or 9:00. 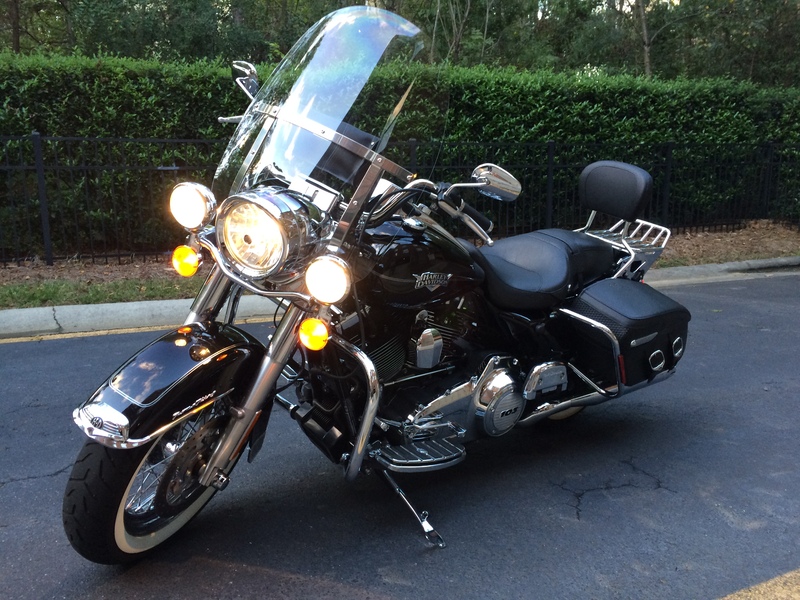 If the weather permits the Road King will make it’s highway debut since it’s seen no road time with me. How was Berkeley? Can’t wait to hear about it. If Liz could get entrance to Cal, that would be a great thing, and you can do worse than live in the Bay area although it’s probably pretty pricey. I’ve tried on end to guess the name of the girl Ellen and Tim are expecting any day – or moment – now. Louise? Not close. Claire (Ellen said that was a name that was considered so score one for Papa). As usual I’m off the mark as I am on so many other things – stocks, the weather, Cub games. 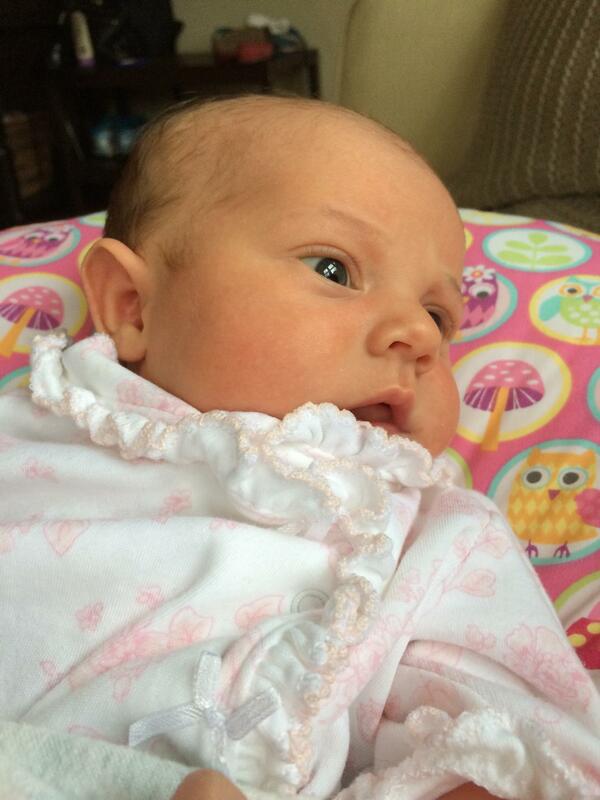 But the name won’t matter as long as my new granddaughter and Ellen come out of the delivery process in good shape. Ellen/Reid: Thanks, Reid, for resurrecting the trip to Chicago. Really looking forward to it. The plane ticket will be secured today and I’ll bump the itinerary to you ASAP. I thought about coming in Thursday night since I have Friday off but will likely wait until Friday to jet in. So watch for something soon. Emma scarfs down some some of the good stuff. 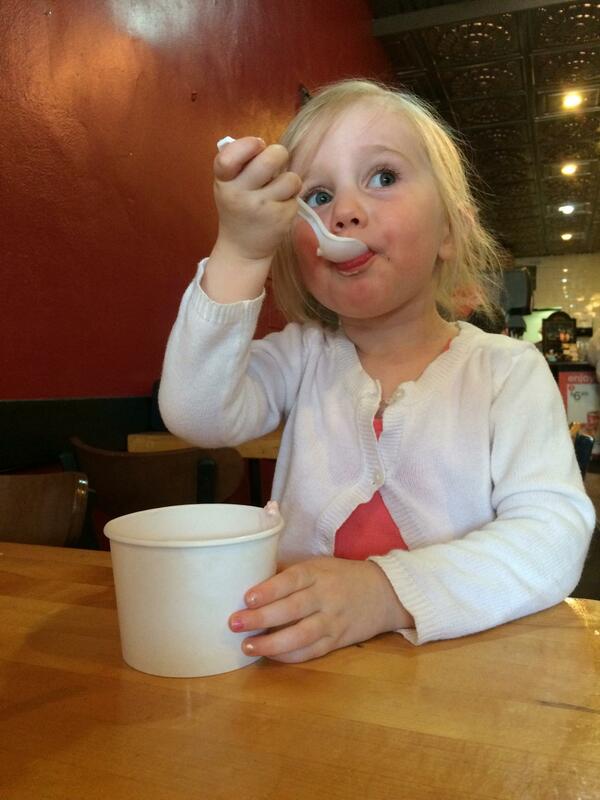 She and her Papa will get to know the business end of a spoon and a bowl(s) of ice cream when I visit next month. Ellen, your time for the-girl-to-be-named-later is closing in. Geez, by the time you get this she could already be with us. It’s so exciting. People have asked if I’ll be there for the delivery but this time around it does make more sense to let the dust settle, so to speak, before heading up to Minnesota. I’m trying to guess her name but am totally stumped as to what you and Tim have selected. Her name won’t start with an ‘E’ since Emma has already claimed that. I haven’t checked out what the more popular names are for girls are in the past couple of years. Louise? Nah, too old school. Continuing to thumb my nose at the HOA garden Nazis by planting a round container with Romaine lettuce. Will augment that today with a container tomato and some basil purchased on Saturday night. The high and mighty have said nothing more about the ‘hearing’ that was supposed to be held about my garden pot crimes. Perhaps they’re marshaling their legal forces. The Charlotte Observer ran a story about how perfect container gardening was for those of us in condos and smaller spaces. Touche. People put moronic styrofoam Easter bunnies and gigantic eggs outside their front doors this week, but the betting here is that the Forces of Evil let those slide. I didn’t know a few heads of lettuce was a felony. I pulled the plug on my pickupyourpath.com group on Meetup. Only five people joined and I did a lackluster job of promoting it and posting pics and such. It was ill-fated from the start. It also cost me $20 a month to host the site and given that I wasn’t doing much to stir the pot, it was time for it to go. Herding the cats in my Golf for One group is plenty enough site management for me. Played twice this weekend. Walked a muny early, early, early Saturday morning with my friend Todd from work and just kind of slapped the ball around. Our rounds are mostly about gabbing about work and liberal politics. The worst sort of golf is when you’re not taking it terribly serious. And the results show. Played yesterday on a fine track called River Hills with my friends Sondra, Jody and Jen. Hit the ball much better but still made bonehead decisions which cost me shot after shot. 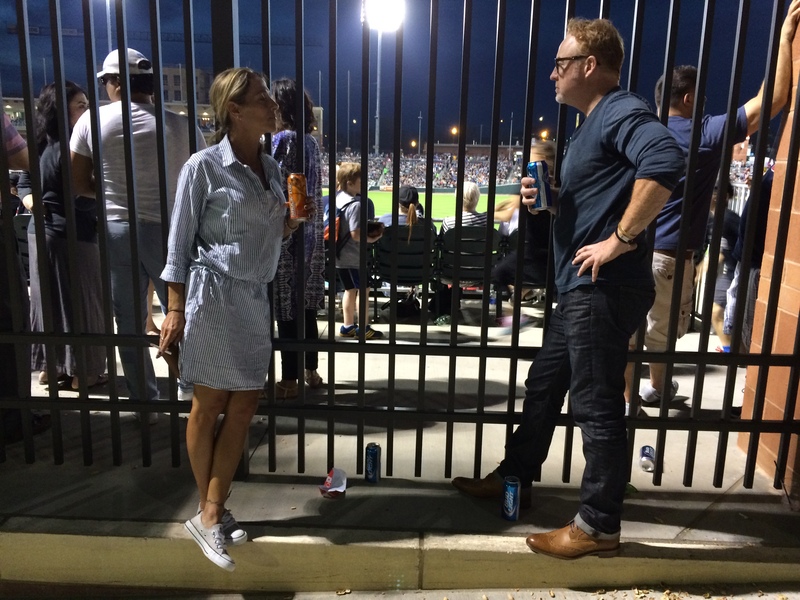 Sondra, Jody and I couldn’t land tickets to the Charlotte Knights game on a gorgeous Friday, but vendors still sold us ‘dogs and beer through the bars – all with a full view of the field. Nice. 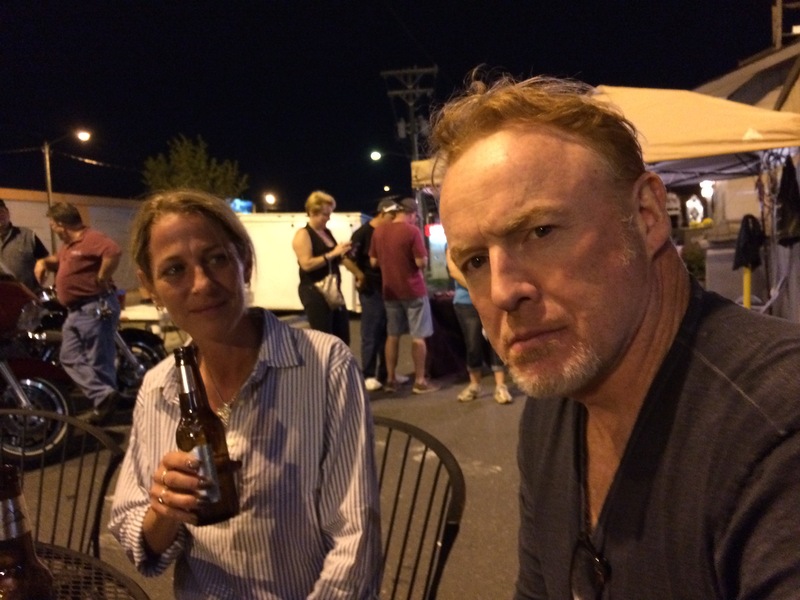 We had a great time at McCoy’s – half the fun is people watching, including these two. that’s right along the rail line, so we spent the next couple of hours listening to live music and watching bikers in my age category. I’ll get my bike there in pretty short order. Hope to order new, and louder, Vance & Hines pipes this week. My class on letters atCentral Piedmont Community College is done. It looks like there will be a repeat in the fall but hopefully there will be more than three students although the three I had were really good. I’m also on tap to teach a general writing course and am really excited about that. To teach is to learn twice. When my dating life in high school would bomb, which was often, my mother used to tell me there “were plenty of fish in the sea.” Well, her saltwater admonition lives on. As an old guy in Florida told me a couple of weeks ago, he practices ‘catch and release’ – but he skips the ‘catch’ part. I can relate, pal. I can relate. Ellen/Reid: There was a short article in the paper this weekend about how the body can acclimate itself to colder temps. Based on this aging body, I ain’t buying it. No way, no how. I had to wear a fleece headband and gloves Saturday and Sunday, and I’m sick of cold. The trip to Florida to see Dave. H. was good in most respects. The drive down in daylight went fine and is a much better option vs. nighttime naps at rest stops which stretch out the trip and exhaust me. We had a lot of fun at a Cajun thing in Pompano Beach plus just lounging/talking at his place, which is just so nice. He and Jane have done a spectacular job on renovating every single thing in their house. The real downer this time was the fishing. It was just a total disaster for three straight days and might be the final nail in the I-have-no-clue-how-to-fish coffin. We spent $$$ for a guide for tarpon and could see the 100 – 200 lb. fish only feet away from the boat just outside Naples. 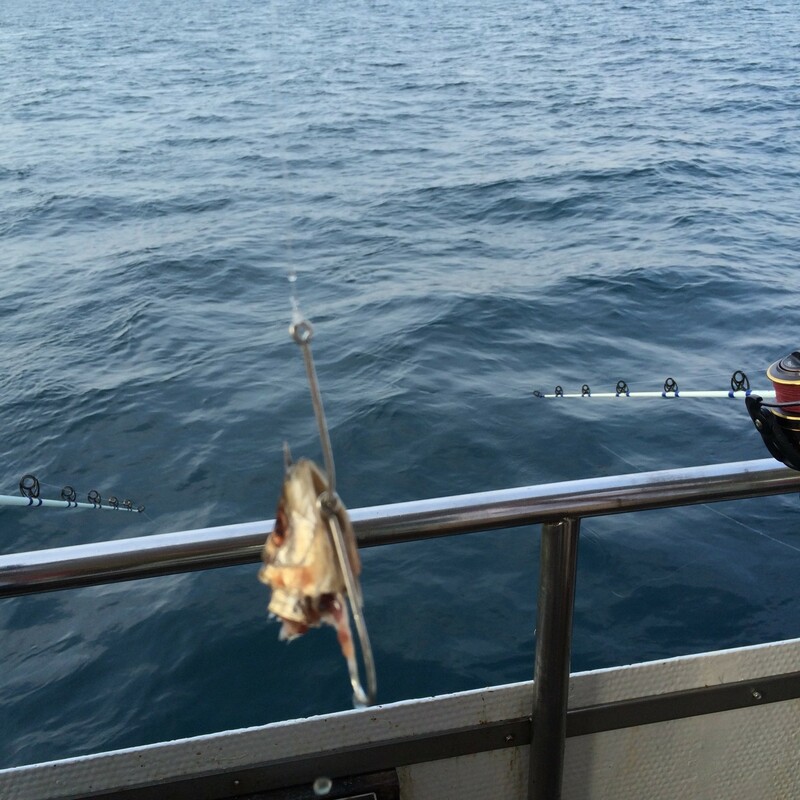 Asleep at the switch: I didn’t even feel the bite. The elderly woman in the wheelchair to my right out-fished me big time.